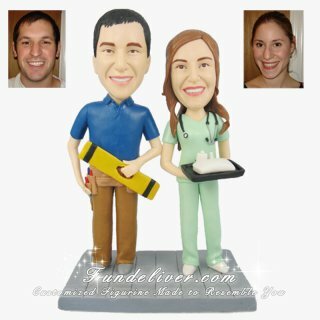 This is a completely customzied construction worker, architect, bulider and nurse theme wedding cake topper. A lovely couple standing on a brick-looking base and groom in builder's workwear, bride in nurse uniform with specified tools such as builder's level for groom and stethoscope, injector for bride. Also can be a perfect wedding gift for those who devote themselves to public health services and architecture.